Definitely not just for children, today's selection for my Easter Treats series is made up of gifts and accessories for the home. 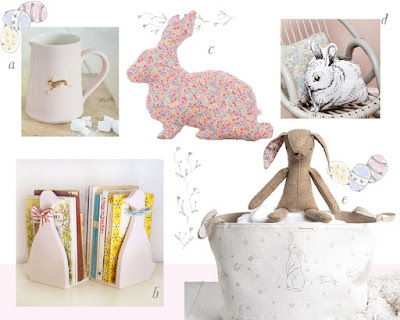 Quite by accident it has ended up being a pale powder pink collection, with a monochrome 'pop' - as the designers would say - in the form of a rabbit cushion. a. Crockery jug from the very talented Jane Hogben. You can order directly from her own website here or do visit the lovely Clarabelle Interiors for very beautiful product photography and inspiration. b Hand crafted 'Jemima Duck' bookends from Charlotte Macey. I remember when Charlotte first started creating beautiful textiles and home wears, about five years ago maybe?, and she brought such a breath of fresh air with her light and lovely designs. I've picked the ducks here because I just love them, but she makes many a bunny too! d. ...And new from Little Cloud this season (I think, I've only just discovered them anyway) are these beautiful monchrome bunny cushions, backed in a Liberty print of your choice. How fresh and lovely are they! e. Finally I had to include this gorgeous toy bag from Peony and Sage. Well, it's called a toy bag, but I guess it could be used for storing anything really. I am wondering about putting one in my bathroom at home for towels and toiletries...?